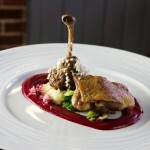 The Abinger Cookery School is a very modern and innovative new cookery school in Surrey. Set up by a team of gastronomic experts and food enthusiasts – including Award winning chef Vincent Clist, lifelong foodie Lewis Davies (majority owner), and gastro ski holiday company, Fish & Pip who have come together to create something very accessible, exiting and most importantly very relevant. The old Abinger Arms in Abinger Hammer has in recent years been a derelict wreck, symbolizing the plight of many `old boozers` forced to reinvent themselves in a bid to remain commercially viable – few however manage to devise something so socially and environmentally pertinent as the teaching of seasonal produce and how best to cook it. The Abinger School`s intention is focused on teaching an array of skills that reflect modern life and after a rather spectacular and modern renovation it has re-opened as the company`s headquarters. The School offers an assortment of 1 and 2 day courses aimed at improving your culinary skills in specific cuisines – teaching you both the basic cooking skills and the `wow food` we all want to cook for our friends and family. So from `Dude Food` which rejoices in our love for `American style home cooking` dishes like `pulled pork` and coleslaw, is set alongside `The Best of British` which celebrates the simplicity of seasonal produce grown locally we swiftly move on to pastry, cakes and bakery, `seafood secrets` and even butchery, there really is something for everyone. The Schools focal `Chalet Courses` are an intensive syllabus set over 5 or 10 days, predominantly aimed at young people: school leavers, graduates, gap year students, it is run in association with Fish & Pips, the gastro chalet ski holiday company known for their culinary delights in Ski chalet resorts since 2006. The 10 day course is literally a pathway to working abroad in the winter or summer ski seasons, or for those heading off to University and wanting to put themselves and their parents at ease! Or vice versa. So I headed down to the school on a warm summer morning in June with high hopes of improving my dinner party repertoire. On my arrival (a very civilized 930am start) I am welcomed in to the main dining area for fresh coffee and homemade cookies! The theme today is Chef Skills `Pasta the Basics`. There is just about enough time to be introduced to my fellow students before we go through into one of the two brand-new bright, spacious and wonderfully equipped kitchens. Chef Vincent Clist `Vinnie` gives us the health and safety speech including the usual boiling water, knives and fire info, we are suitably armed and aproned before getting down to business. The ingredients are all prepared and divided out in advance to save time and the recipes for the day are waiting for you on the counter, these are yours to keep in order for you to, `re-create the magic` (hopefully). The First thing we make under the guidance of our teacher/chef is a white chocolate Pannacotta which is one of the easiest things to do! Literally just heat up some cream, white chocolate, sugar and gelatin and put it in the fridge to set! (Why haven`t I made this before? I ask myself) Next we butcher and slow braise rabbit preparing the whole stew from scratch, Vinnie sharing himself out equally and fairly among the different competency levels of his students. The pace then picks up as we move onto the next dish; Spinach and Ricotta tortellini in a seasonal spring vegetable stew; we are faced with multiple tasks broken down into many simple processes and immediately you realize that this is genuine experiential learning, a practical lesson where every participant has a hob, oven and prep area. I have watched hundreds of chefs making tortellini on TV but doing it under the direction of a professional makes all the difference. We eat our Spring Vegetable broth and tortellini`s for lunch (of which the star is the broth -seriously delicious!) and then we`re back to work. Vinnie`s passion for cooking, sustainability, and seasonality is palpable but he delivers it in a fun and informal manner, he is more than happy to answer my constant questions about making a good stock or making a good pizza dough or béarnaise sauce. So now it`s onto the gnocchi – another really simple dish to go with our stew, which by the way we check and taste constantly throughout the day and which will accompany us home tonight for our supper. By the time we`ve made our second batch of pasta dough (fresh Spaghetti) then Pumpkin ravioli and enough Carbonara to feed the Italian football team the day is spent and my arms have almost fallen off! I realize I`m pretty shattered but really inspired, I`ve learnt a lot. So with my vast amount of goodies packed neatly into a paper bag and smelling like a stock cube I drive home wondering who I will cook my Pumpkin ravioli with sage beurre noisette for. And which course will I do next? These kinds of courses have a tendency to take place in a rustic French chateau, or in the basement of a warehouse in Shoreditch. They have a tendency to cost a fantastic amount of money. The Abinger cookery school however is a very reasonably priced and very accessible alternative – even boasting a luxury B & B for those traveling further afield. I am sold. Courses start from £75 per day. Don’t miss the `Easy Entertaining Class` with Adam Byatt at The Abinger Cookery School on 11th July. There are only 16 places available. Only 16 places so book fast!